The Medici, a powerful banking family that rose to prominence during the 15th century, were generous art patrons. 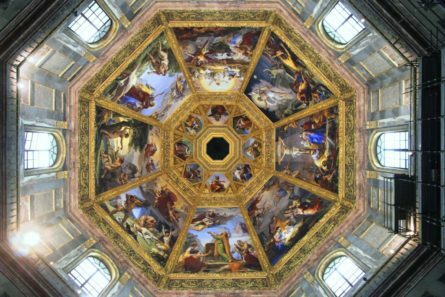 Your private English speaking guide from Italy’s Best will take you on a Medici tour that explores the Medici family and the relationship between their political power and generosity towards art. Begin your tour at Palazzo Medici Riccardi, one of the family’s main residences that was at one time a temporary home for Michelangelo. Don’t let the rustic exterior fool you! Enter and take in the classical elegance such as the Renaissance courtyard; the Magi Chapel with frescoes by Benozzo Gozzoli; and the Luca Giordano decorated Baroque room. The palace served as an archetype for other Florentine residences built by wealthy merchants and bankers. Next walk through the bustling street market to the Church of San Lorenzo and see Brunelleschi‘s Old Sacristy with pulpits designed by Donatello as well as the the Laurenthian Library with Michelangelo’s elegant staircase. The Church of San Lorenzo served as Florence’s Cathedral until the 8th century and in the 1400s, the Medici family commissioned a rebuilding of the entire church in the new Renaissance style, which became their private church, where baptisms, weddings and funerals of the family were held. Brunelleschi’s Old Sacristy is a masterpiece of the early Florentine Renaissance, known for its geometric architecture inspired by Classical Roman buildings. The Medici’s private burial chapel features works from some of the greatest Renaissance artists: Donatello, who made the painted stucco roundels decorating the vault and the bronze gates, a funerary monument to Piero and Giovanni de’ Medici sculpted by Andrea del Verrocchio. Leonardo da Vinci, a pupil of Verrocchio, reproduced the large sarcophagus, in his Annunciation which is on display in the Uffizi Gallery. After Brunelleschi’s death in 1446, Antonio Manetti Chiaccheri took over the completion of the Basilica, who made changes to the original plan leaving the Old Sacristy as the only remaining Brunelleschi work. Lastly to cap our Medici tour, visit the Medici Chapels, the private mausoleum of the Medici Grand Dukes, and see Michelangelo’s New Sacristy built between 1520 and 1555 and his incomplete tombs, which depict two Medici dukes as classical Roman warriors as well as powerful personifications of Dusk and Dawn, Day and Night. This unique Florence cooking class by Boutique Florence lets you select ingredients at a local market and then return to the kitchen and cook a feast. During this active kids tour in Florence, your family will visit the Adventure Park, just outside the city, and participate in a wide range of activities. During this private, gourmet Florence food tour, enjoy tastings of truffles, olive oil, and balsamic vinegar. Finish your day in a gourmet gelateria. Learn about the life and work of Michelangelo during this tour in Florence, which takes in the famous David, as well as visits Michelangelo's Tomb.